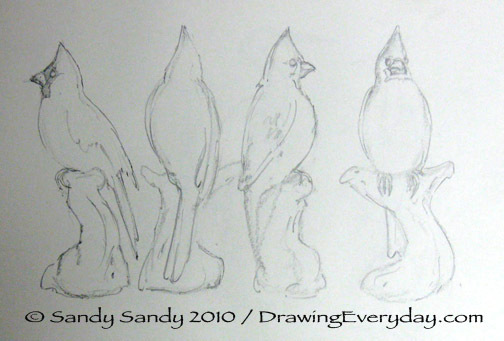 Here are four two minute gesture drawings of a Cardinal figurine. This is a great exercise. After each two minutes is up, turn the object 1/4 turn. You can accomplish a lot in a very short time this way. Here's my drawing from last week's sketching challenge photo. 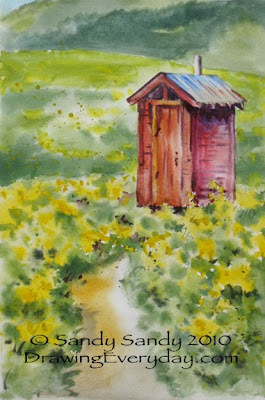 I've simplified the scene and used some artistic license with the colors of the outhouse. 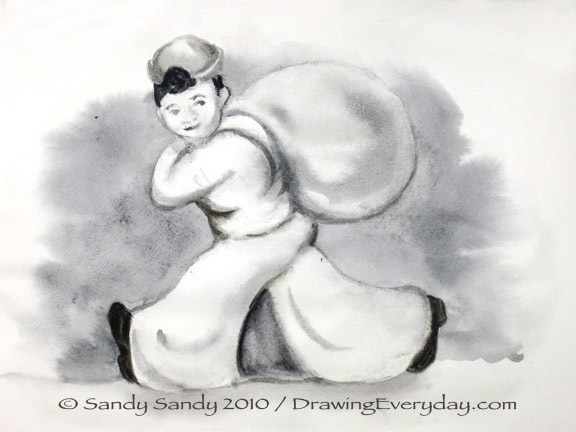 Like all my sketches, it was done on regular drawing paper. I like an 11" x 14" or 9" x 12" Strathmore 300 series drawing pad. You can see the one I recommend on my brand new page "Sketching On Location". 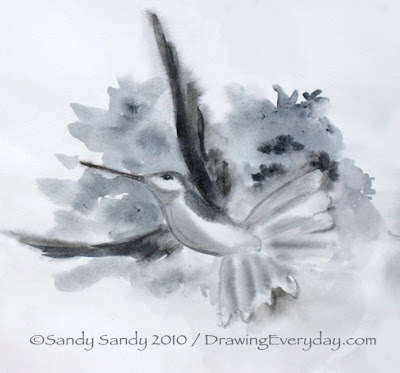 Tip Of The Day: I have just started putting a piece of watercolor paper behind the sheet that I'm working on. It prevents the wrinkling of the sheets underneath from the moisture. For our New Sketching Challenge, I'm posting another photo taken last July while on vacation in Crested Butte Colorado. 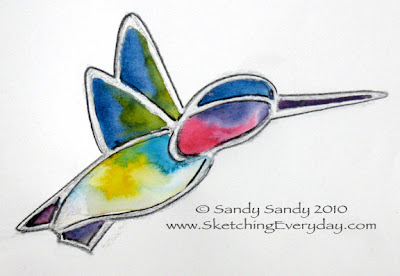 This color sketch was inspired by a little stained glass sun catcher that I have hanging over my kitchen sink. 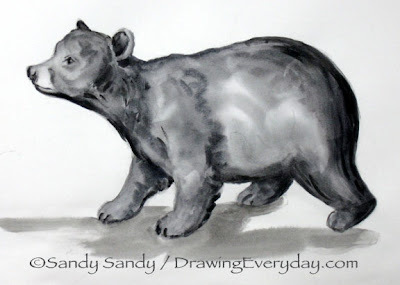 I opened my paint palette yesterday to give it a misting and starting thinking that I'd like to do some sketching in color again. I've been thinking a lot about SHAPES lately this month, ever since I started up Drawing Everyday again. 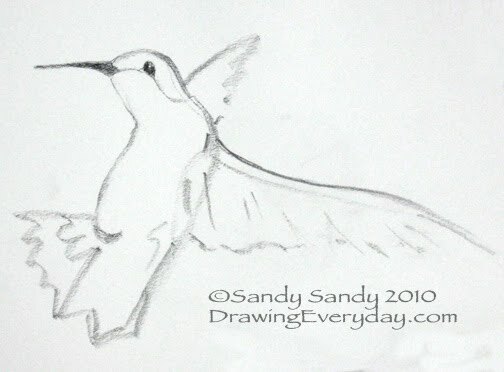 When I saw that hummingbird hanging there today, I knew I had to just have my way with it. What fun! 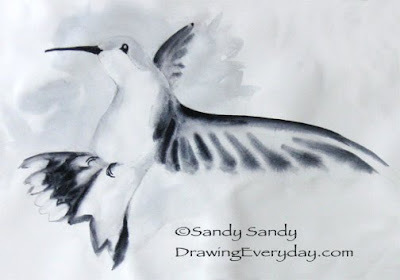 If you are thinking that you'd like to try a real easy one, give copying this a shot! AND think S H A P E S . . . Here's another Blind Contour Drawing. This one was done today from a little wooden Wren bird carving. My friend, Lee Gates, is a real elephant lover. It's her birthday today, so this drawing was done for her. 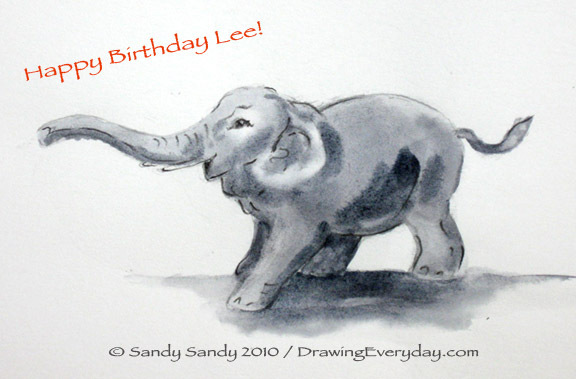 Happy Birthday Lee and Happy Birthday Week! I'm siting here in my parent's motor home. It's parked out in my backyard. We've been having a great visit and staying busy doing day trips over the past week and a half. On Thursday they'll be on their way up to Canada for a month long tour. 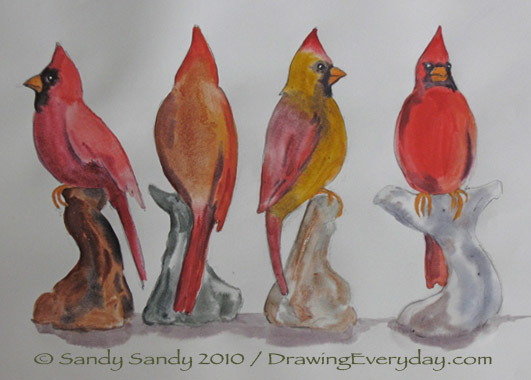 I've been sketching with my mom and finished up the challenge sketch here tonight. 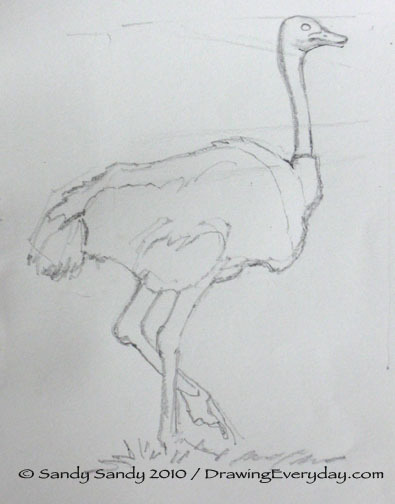 Here's the first two steps of the ostrich challenge sketch. I've got company visiting so I'll finish this up tomorrow. 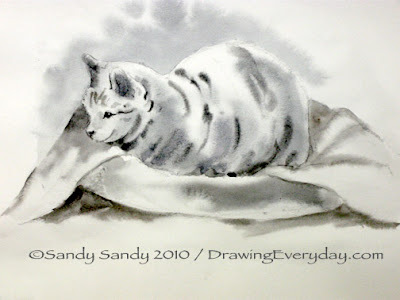 Here's a finish wash on yesterday's pencil sketch and our sketching challenge photo for this week. I hope a few of you will give it a try! 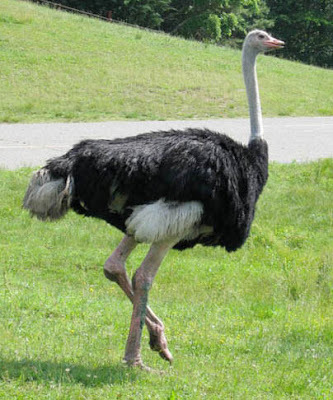 I will post my interpretation of last week's ostrich challenge photo tomorrow. Happy Father's Day to all you dads! 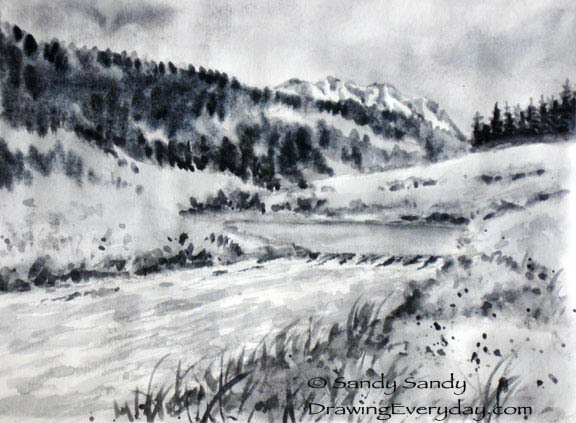 I spent a good part of the day going through some photos of Colorado that I took last July, so I decided to draw from one of my favorites for you tonight. 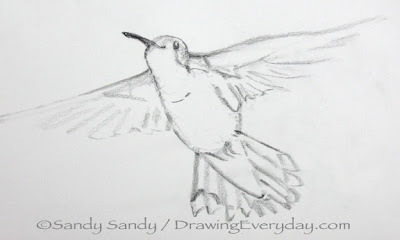 Here's the first two steps of my sketching system done in pencil. I'll add the wash tomorrow. 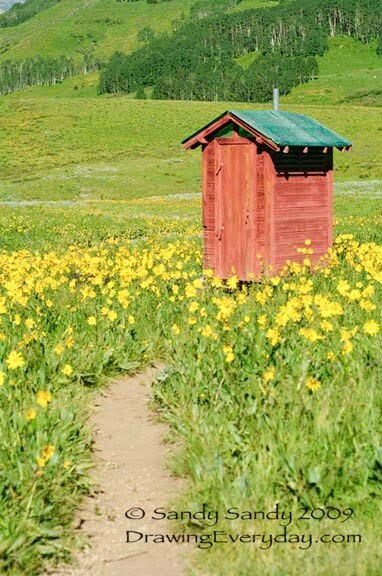 I'm thinking of posting a Colorado shot for our next challenge. Anybody interested? This drawing is of a vintage bank I found in the basement. You can see a photo of it in my first post here this summer. 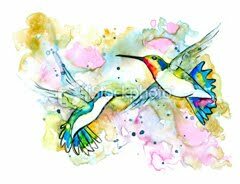 Hummingbirds are the only species that can fly backwards. Now license this image in high resolution. 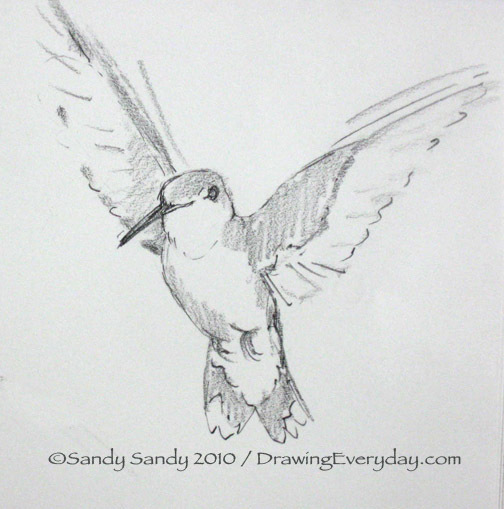 I used a kneaded eraser to remove some of the shading I did on this hummingbird drawing which I posted on Thursday. Then I added some more detail and values with a watercolor wash. 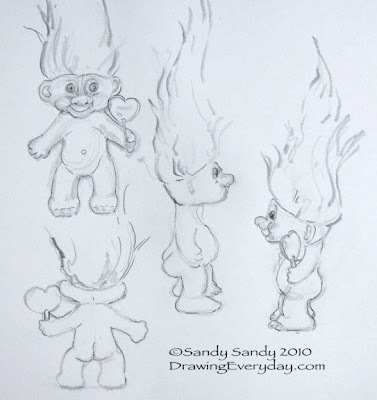 Here's my interpretation of last week's sketching challenge. Today here's a gesture sketch of my buddy, William. I spent some time sketching the hummingbirds today. This is my favorite quick gesture drawing. 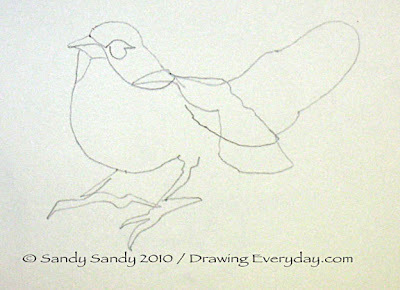 This drawing proves to me that all it takes is a few strokes in the right place to capture the essence of your subject. 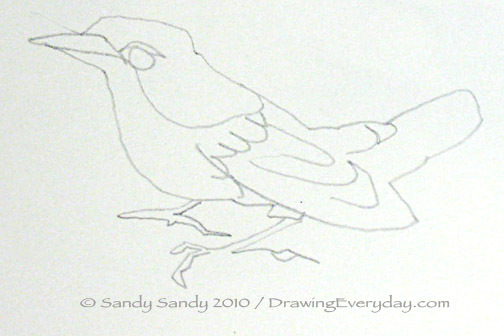 A Blind Contour Drawing is extremely valuable in learning to SEE BETTER. This is not meant to be a great picture. It's a training exercise. 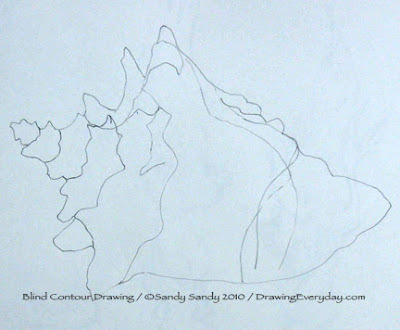 See more about Blind Contour here. Go ahead, what have you got to lose? Give it a try yourself! And remember, everything is sketchable. 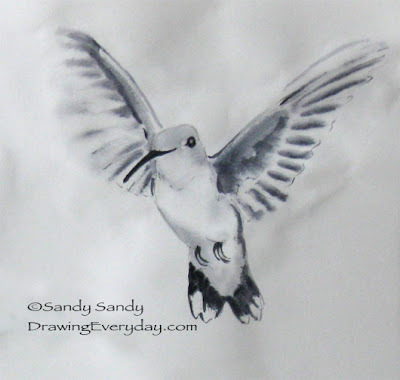 I strongly recommend drawing from life! I think it teaches you to really see. And hey folks . . . that's a H U G E part of drawing! 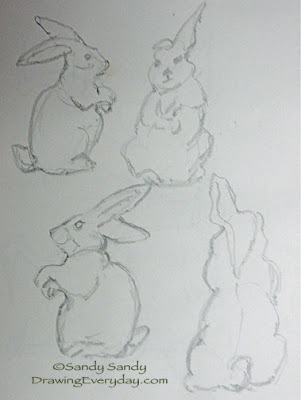 I'm working on doing drawing exercises everyday now to get my sight muscles back into shape. Today's sketch is a series of two minute gestures of a small whimsical unicorn stallion figurine that I've owned for decades. This is the first time I've attempted to draw it. Like I always say, "Everything is sketchable." 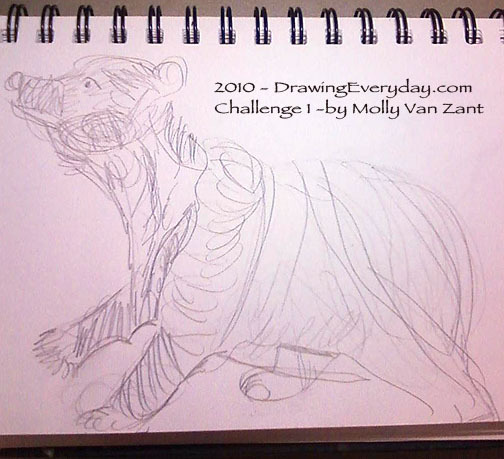 Today I'm posting my bear challenge sketch in two parts, with and without the wash.
Below is another drawing sent in by Molly VanZant. She writes, "I hope you don't mind I sent my second attempt.. you don't have to publish it or comment on it, I don't want to take up your time but I did try again so I thought I'd send it on. Thanks for your blog & work, I love it!!" Here's the new photo for this week's sketching challenge. 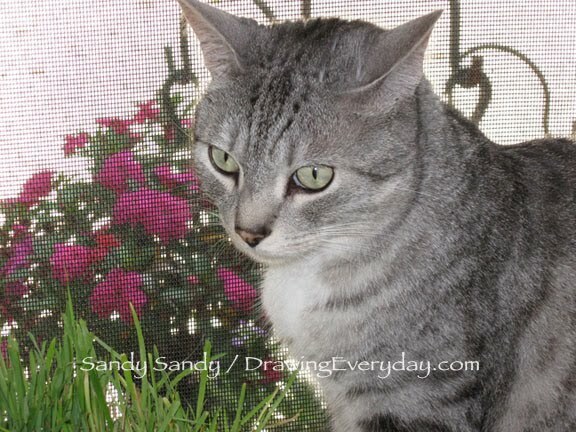 It's a shot of Tommy on the porch with his cat grass, watching the hummingbirds. I hope some of you will give it a try. 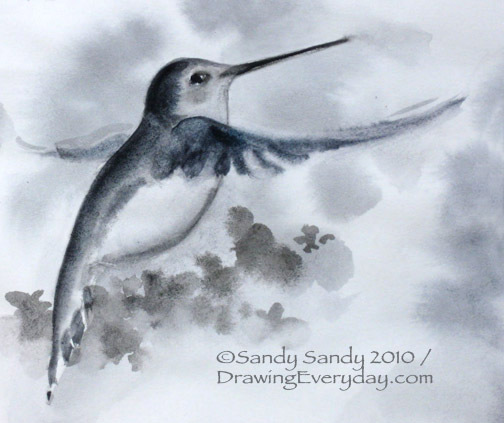 Lots of hummingbird action here today! I think the first broods are starting to emerge now. I am looking forward to even more action here soon! 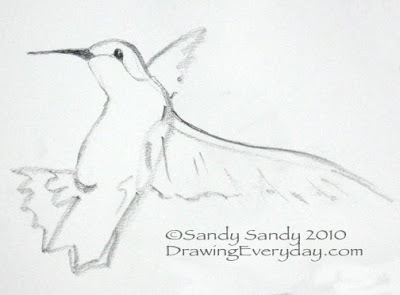 See my Hyped Up Hummingbirds Video here. Don't be afraid to try to draw something fleeting. If you get the big shapes down in a minute or two, you can always add the details later, (or after the subject moves). 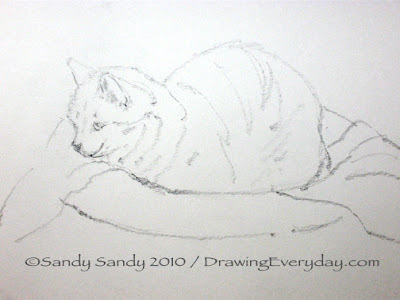 Here's a quickie of Tommy in the studio. He's not allowed in because he gets destructive. He chews paper. He LOVES to be in the studio though. I guess it's like the forbidden fruit. First thing he does is jump in my studio cat's bed. 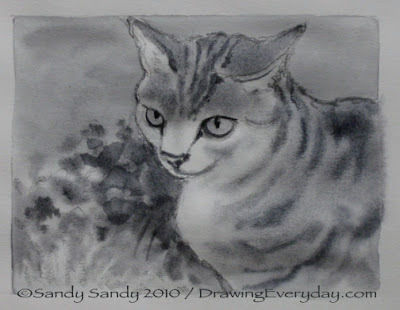 He gets this satisfied look instantly - sorta like the Cheshire Cat. He only sat still for a couple of minutes, but I was able to get this one in for today. 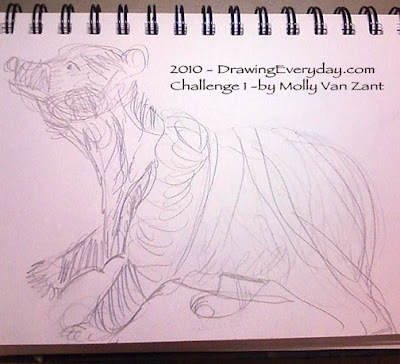 Look at the hippo tutorial on my SIMPLE SKETCHING STEPS lens. 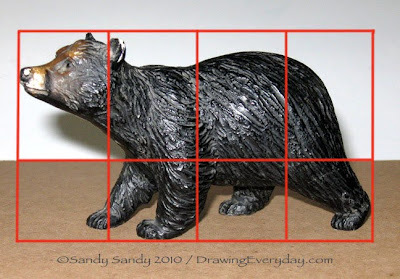 I think it will help you with seeing shapes. 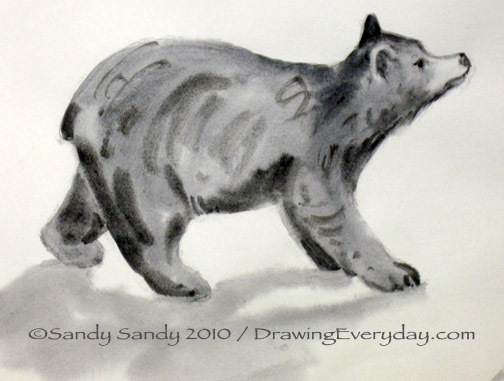 My Bear Drawing and Our First Challenger Checks In! 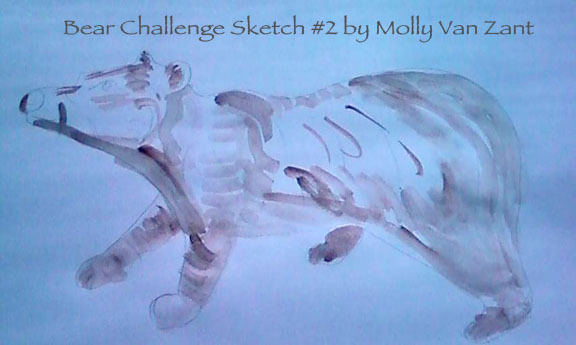 I got our first drawing in already for this week's sketching challenge! 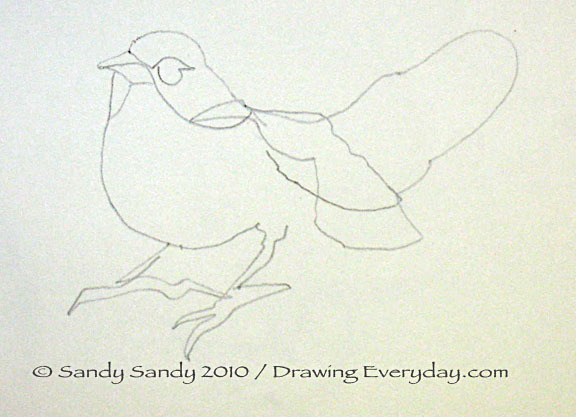 Molly VanZant writes;" I tried to look for shapes but I got distracted by the lines." It's a common problem with me too Molly. One trick I know of to enable you to see shapes better, is to draw a grid on your photo and then draw the same proportions on your paper. 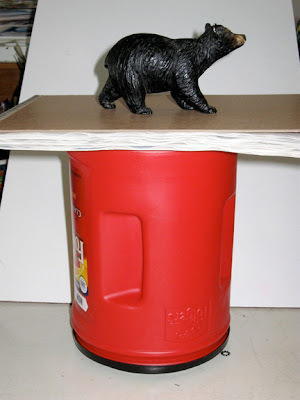 This bear breaks down evenly into four sections vertically . Then I drew a line through the bear on the horizon line. Now try to duplicate the shapes in each section on your paper and tell me if you find it any easier. 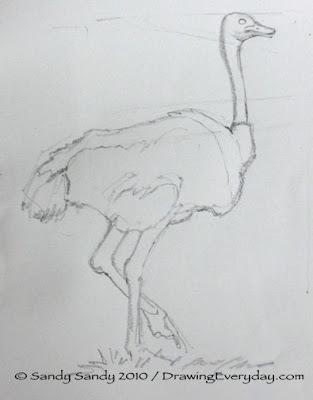 I like the drawing very much overall, however it got a little big on the page. I'd recommend getting a bigger pad or starting smaller. 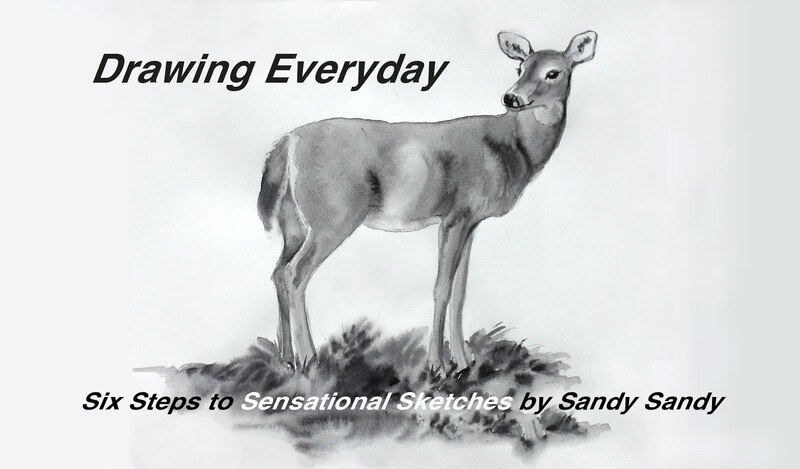 I've listed the drawing supplies I use on my new "Simple Sketching Steps" lens. Here's my first bear sketch from yesterday with the wash added today. OMG! 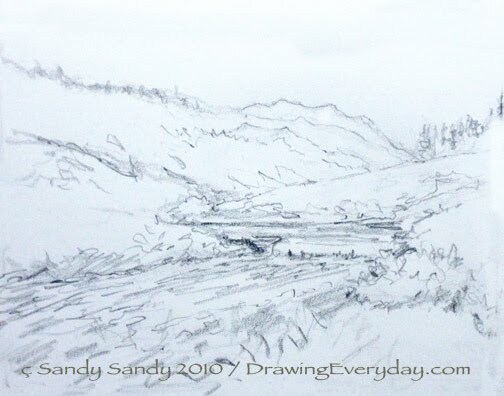 Here it is the first day of June and the start of another fun filled summer of sketching everyday! I went down into the basement today, looking for stuff to sketch. Remember, everything is sketchable! 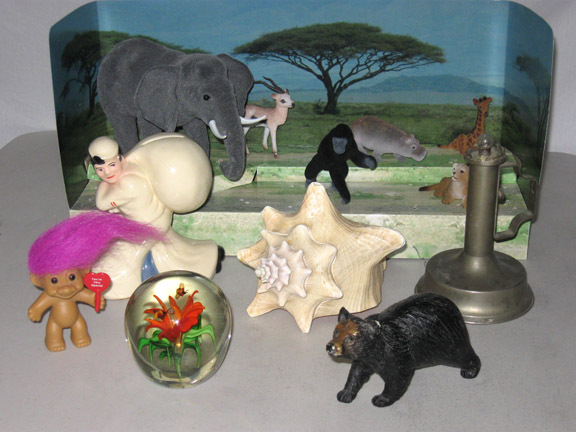 Here's the items I came upstairs with. I decided to draw the bear, so I put it up on a large coffee can to bring it up to eye level. 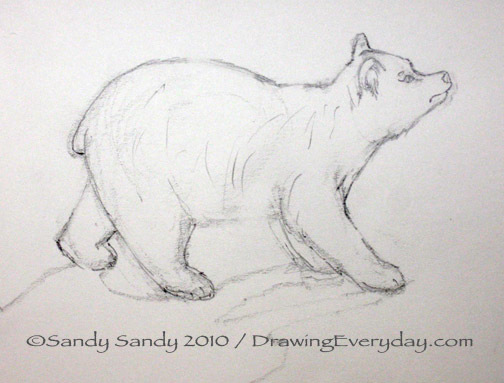 Here's my bear drawing for today. It's not very impressive. 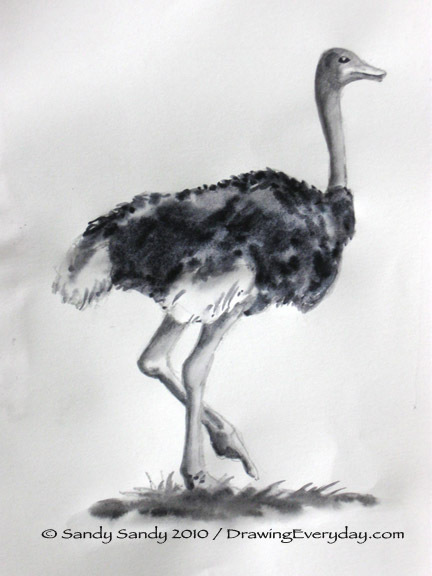 I'll put the watercolor wash on it tomorrow. I have to keep telling myself that this is an exercise! It doesn't have to be a masterpiece. I am really rusty, so I'll be starting off kinda slow this year. Please BEAR with me. 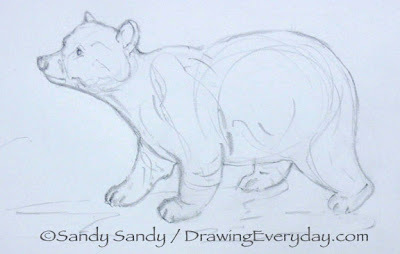 I decided to post this photo of the bear as *THIS WEEK'S SKETCHING CHALLENGE because I really like all the negative space and shapes around him/her. Squint a lot and look at SHAPES inside and outside of the figure as you draw. 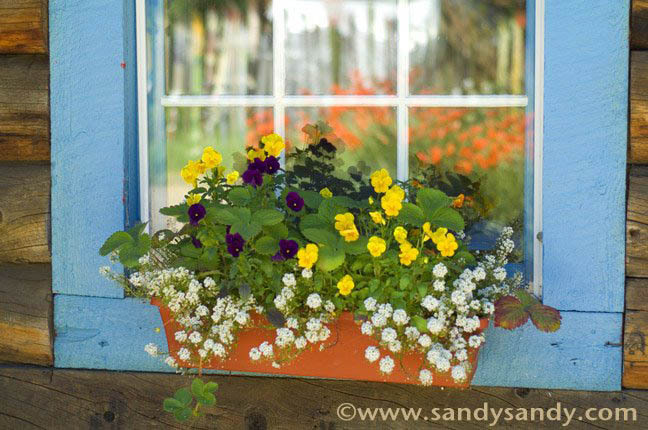 See shapes, not things and try not to get too wrapped up in the results. It's the process that counts. It will get easier the more you practice, I promise! *THIS YEAR'S SKETCHING CHALLENGES - I'm posting a photo at the beginning of the week again. 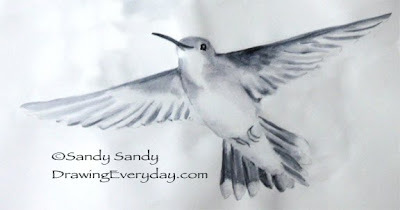 If anyone chooses to sketch it and send your drawing to: sandy@sandysandy.com, I'll post it here on the following Sunday or Monday (unless you tell me otherwise) with my own interpretation.